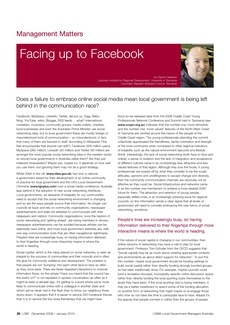 eCite - Facing up to Facebook: does a failure to embrace online social media mean local government is being left behind in the communication race? Facing up to Facebook: does a failure to embrace online social media mean local government is being left behind in the communication race? Facebook, MySpace, LinkedIn, Twitter, del.icio.us, Digg, Bebo, Ning, YouTube, wikis, Blogger, RSS feeds ... what? International cricketers, musicians, community groups, media outlets, charities, local businesses and even the Australian Prime Minister use social networking sites, but to local government these are mostly foreign or misunderstood tools of communication – so misunderstood, in fact, that many of them are banned to staff. According to Wikipedia ("the free encyclopedia that anyone can edit"); Facebook (300 million users), MySpace (260 million), LinkedIn (50 million) and Twitter (45 million) are amongst the most popular social networking sites in the western world, so should local governments in Australia utilise them? Are they just irrelevant timewasters? Maybe yes, maybe no: it depends on how well you use them, but ignoring them may not be a good strategy.